U.S. President Barack Obama pressed Prime Minister Hun Sen on the government’s human rights record during a closed-door meeting between the two leaders in Phnom Penh yesterday, calling for fair elections and the release of all political prisoners. In the first visit to Cambodia by a serving American president, U.S. deputy national security adviser Ben Rhodes said Mr. Obama devoted his entire meeting with the prime minister to human rights issues, according to Reuters. “In particular, I would say the need for them to move toward elections that are fair and free, the need for an independent election commission associated with those elections, the need to allow for the release of political prisoners and for opposition parties to be able to operate,” Mr. Rhodes said, referring to the discussion between the two leaders. Mr. Rhodes added that Mr. Obama also told Mr. Hun Sen that Cambodia had “much further to go on that set of issues,” and agreed that the meeting could be described as “tense,” according to Reuters. Mr. Obama arrived in Cambodia yesterday afternoon from Burma in a trip through Southeast Asia to promote the U.S.’ plans to beef up its military, along with a diplomatic and economic “rebalance” of the region in the face of a rising China. In the weeks leading up to the visit, rights groups were joined by lawmakers from Australia, Europe and the U.S. in raising the issue of the country’s poor human rights record. A letter to the president from some of the most senior lawmakers in the U.S. called on Mr. Obama to raise everything from politically motivated convictions, a flawed electoral system, land grabs and evictions with Mr. Hun Sen. Speaking at a press conference after the meeting, Council of Ministers Secretary of State Prak Sokhon said Mr. Obama had raised human rights in his talks, but only because he had been asked to do so by other U.S. lawmakers. During the frank exchange, Mr. Hun Sen also insisted that Cambodia still had a better human rights record than some of its regional partners in Asean, Mr. Sokhon said. “Through a campaign of slander, it would seem as though Cambodia is a bad student, worse than Myanmar, that a teacher that was asked to help Myanmar has become a bad person,” Mr. Sokhon told reporters. “In our country, politics is wide open to all political parties and the opposition parties have the right to do anything in accordance with the law,” Mr. Sokhon continued. Ahead of his visit, Mr. Obama was urged specifically to press Mr. Hun Sen on a pardon for opposition leader Sam Rainsy, who is currently in self-imposed exile avoiding an 11-year jail sentence on charges widely believed to be politically motivated. Mr. Sokhon said the opposition leader’s name did not come up in the talks with Mr. Obama. “Samdech made it clear that in Cambodia there are no political prisoners just because there is a report and a protest demanding the release of all political prisoners,” he said. He explained that Mr. Obama did raise the case of Mam Sonando, the popular radio station owner, who was sentenced to 20 years in jail last month on charges of leading a so-called insurrection. Those charges have also been widely condemned as politically motivated. 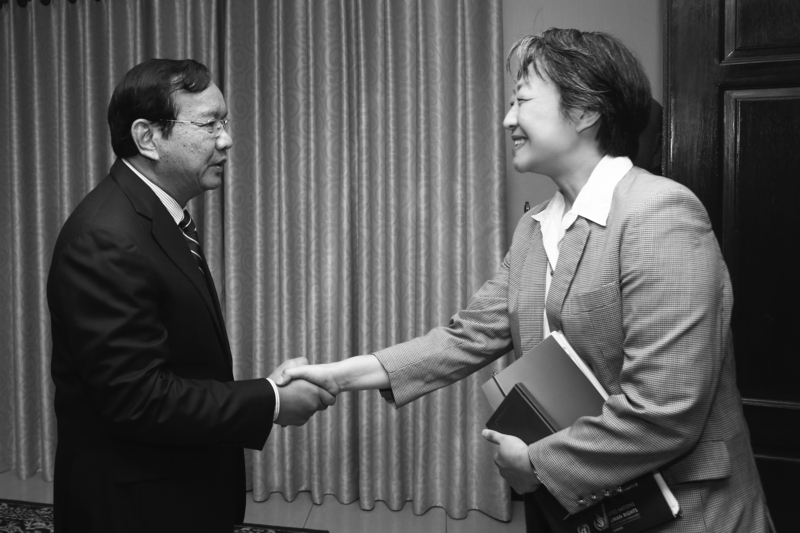 He said Mr. Hun Sen also told the U.S. president that reports of mass evictions were overblown. “Regarding land issues and forced evictions, Samdech acknowledged that there have been some because there were some people who moved onto land illegally, so it [the government] was forced to implement the law to remove them,” he said, adding that Mr. Hun Sen had attempted to assure Mr. Obama that such cases were rare. Rights groups have singled out the government’s land concessions to agribusiness and mining firms as the country’s premier human rights issue, having affected some 400,000 people over the past decade. Mr. Sokhon said that the prime minister did raise at least one issue of his own—the more than $400 million with interest Cambodia still owes the U.S. dating back to the 1970s Lon Nol government. 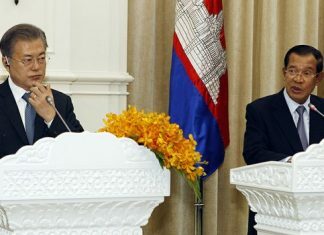 He said Mr. Hun Sen repeated Cambodia’s proposal that it pay back only 30 percent of the debt at 1 percent interest and agree to spend what it would have given the U.S. on education, demining and cultural projects. The U.S. Embassy did not immediately reply to a request for comment. Mr. Obama is in Cambodia attending the Asean and East Asia summits and is scheduled to depart today for Japan.